On Sunday 5 April, we will celebrate our risen Lord with two services. The first of these, at 06h00, provides a wonderful way of greeting the Easter day, starting off in complete darkness, and culminating in the lighting of the Easter candle. At 09h00, there will be a glorious celebration of the resurrection, with celebratory music and liturgy, and sermon by Bishop Brian Germond. Be sure to join us for one of these service! *Easter Eucharist (combined service) at 09h00. 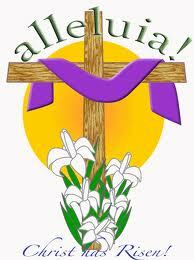 The Rector, wardens and staff of St Francis Anglican Parish pray that you will have a blessed and peaceful Easter. 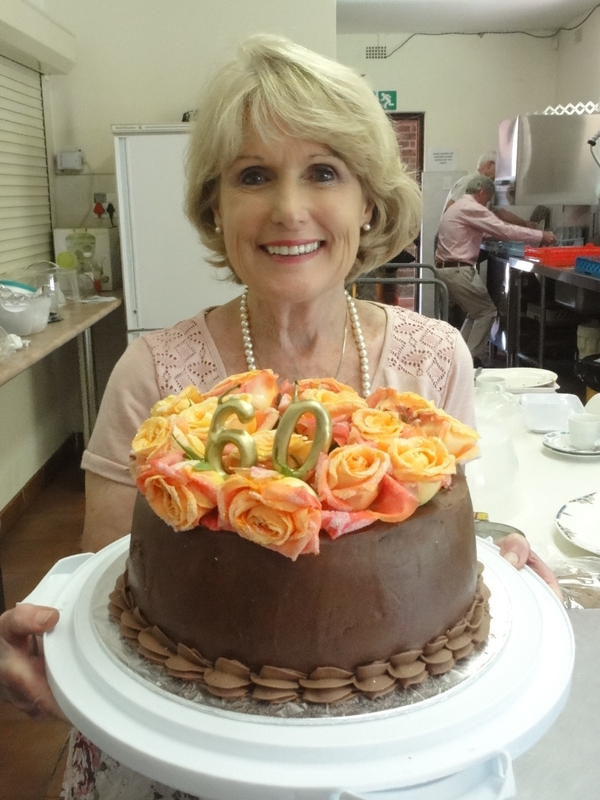 Val Archer with the magnificent birthday cake she made for Rose Gray. To see if you are on duty, please click here. Please make sure that you scroll down to the correct date, ie 5 April 2015. Thanks to the clergy for leading the Holy Week and Easter services, to Bishop Brian Germond for preaching, and to the St Francis Singers for leading the music. Thank you also to Val and Neil Archer and their colleagues for organising a fantastic 60th birthday tea for Rose Gray last Sunday. Our love and greetings to Rose as she celebrates this milestone. 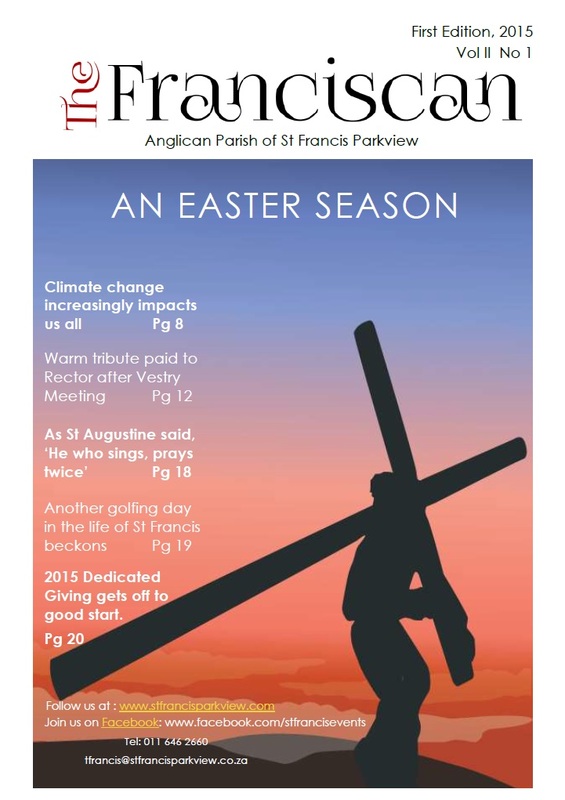 The latest edition of The Franciscan, our parish newsletter, is available and is packed full of news and stories. Collect your copy from church, or read it online by clicking here. Don’t miss out on this colourful and interesting publication. As at today, we have 24 commitments for 4-ball entries for our Golf Day on 15 May! This is a wonderful response, but we need to get to 30 4-balls, so please continue to encourage your work colleagues and friends to participate in this important parish fundraising event. We also need sponsorships and prizes and ask that you consider how you might be involved in this. Speak to Keith on 082-416-5401, Mymie on 082-651-3621 or Theo on 082-900-0168. “To Kill a Koeksister” will be staged at St Francis on Saturday 18th April at 6pm. It’s a “whodunit” affair where the audience may get involved in solving the mystery. You, or the person next to you, may be a suspect! We will have soup, bread, coffee and (of course) a koeksister! Bring your own drinks. It will be great fun. Booking with Bart Cox at 011-447-1139 or bcox@telkomsa.net. Bring your family and friends. 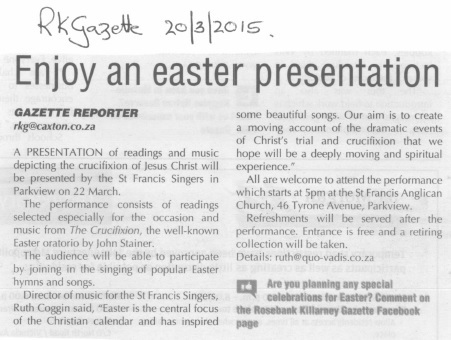 Thanks to those who attended the special Lenten service on 22 March presented by the St Francis Singers. We had an excellent attendance of nearly 100 people, including many visitors, to listen to and participate in the programme of words and music on the Crucifixion of Christ. We are also grateful to Radio Today and the Rosebank and Killarney Gazette for advance publicity given to the event. See the article by the R&K on the right and listen to the Radio Today advert here. The latest batch of baby clothes knitted for poverty-stricken new mothers on the KZN South Coast will be delivered this week to our project partners at St Simon’s Anglican Church, Trafalgar. Theo and Ruth Coggin will set off for the South Coast tomorrow (Sunday) after the 09h00 Easter service with a full carload of goodies for the babies. If you would like to contribute towards the baby packs that are assembled for handing out, please give your monetary donations to Theo or Ruth at tomorrow’s service. They will be used to purchase items such as nappies, baby socks, baby proofs, babygrows, etc that are included in the packs with our knitted items. 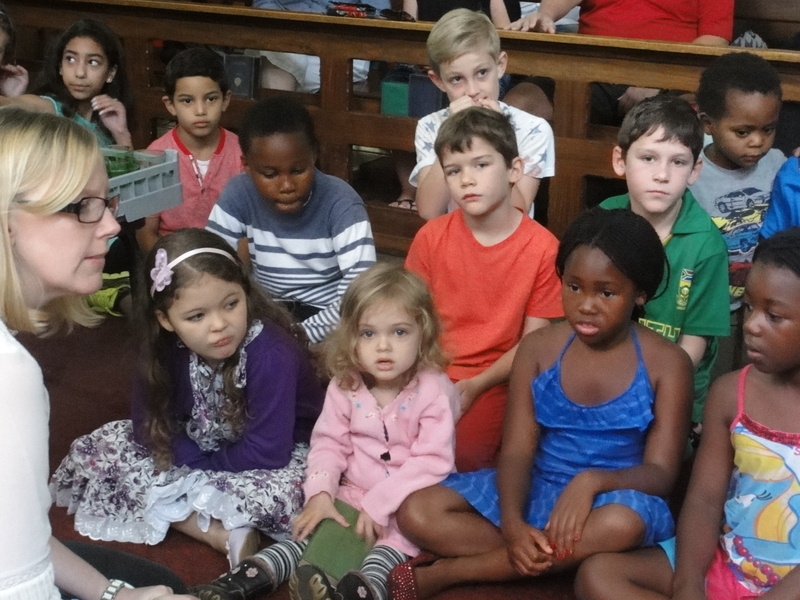 There was an excellent turnout for the Good Friday children’s service yesterday at St Francis, with a record number of 30 children and 29 adults. Youth Pastor Yvette Angoma (see photo on the left) had the children hanging on to every word of her interactive enactment of the story of Christ’s crucifixion, with husband Mol also playing a role. This is St Francis’s way of ensuring that the youngsters of our community are also included in the Easter story. In response to requests, the weekly pew leaflet is now published on our website on a Friday once it has been finalised for the following Sunday. Click here to read this week’s pew leaflet. Please note that, once you have reached the pew leaflet site, you will need to zoom in (see icon on the top right of the screen that looks like a magnifying glass with a + sign in it) to be able to see it properly. Are you following our website and Facebook page? Both contain a wealth of excellent postings and reach an audience far beyond our parish, city and even country. Please “like” both these pages.